Naula keeps all your medications and appointments in one place, with video instructions, reminders and an easy-to-use calendar. Easily input your treatment — IVF, IUI, FET, Egg Freezing, Surrogacy or Egg Donation — and choose from the most-prescribed medications and appointment types, with the ability to add your own. Every day you can see what medications and appointments are on the horizon, with videos and step-by-step instructions for every medication, checking each off as you finish. See your entire treatment in a glance to help plan the rest of your life too! 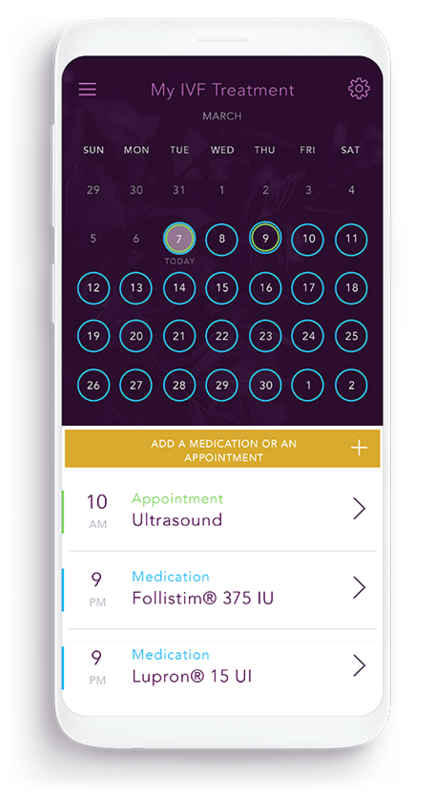 Naula keeps track of all your medications and appointments in an easy-to-use calendar, taking the stress out of remembering which medications and appointments are when. Never forget a medication date or time with automated reminders and alerts on your phone. Undergoing a second, fifth or tenth treatment? Duplicate your schedule with one touch. Video and illustrated step-by-step instructions for the most-common treatment protocols are right at your fingertips. No more fumbling with different sets of paper or links for each medication. Naula manages all common Assisted Reproductive Treatments including IVF, IUI, Egg Freezing, Surrogacy and Egg Donation. Naula uses 128-bit SSL encryption for data transfer and NSA-level 256-bit AES encryption of personal information. We know how stressful going through a fertility treatment can be -- we’ve been there. We created Naula to make the process easier every day, by gathering all the information on your treatment in the most convenient and beautiful way.